Need a Novelty mustache for a costume, or just want to liven things up at the next party or get-together you attend? 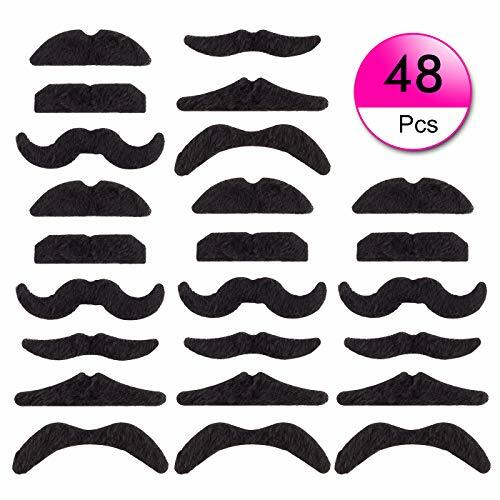 Bring this whole batch of 36 mustaches to a party and it's sure to be a hit, like mustache party, masquerade party, fiesta party, spy themed party, Cinco de Mayo party, birthday party or other themed parties. You could keep all the mustaches for yourself, and sneak off every now and then to change into a different one. Every time anyone sees you, you'll have a different mustache! Or start handing out mustaches to everyone, letting them choose their favorite from the 12 different styles. Soon the whole room will be full of folks laughing at each other's 'staches and taking pictures to laugh at later. that's another time to make sure everyone has a mustache on! The photographer won't have to remind everyone to smile. Young and old alike will laugh at how one of these mustaches changes the look of a person, whether it's a child or an adult, a boy or a girl, a man or a woman. This product is sold with a full money-back guarantee. If you're dissatisfied with your purchase for any reason, contact us for a replacement or refund. A BIG BATCH OF FUNNY FALSE MUSTACHES. 12 different styles, three of each style, 36 mustaches in all. And all of them are made from fiber for a more realistic look. A RANGE OF FUN AND SILLY STYLES. Including styles like Wild Bill, Fu-Man-Chu,, Con Artist, Stache O' Mania (Hulk Hogan), and more, you'll have lots to choose from. EASY TO APPLY AND REMOVE. Just peel off the backing paper and press in place. Peel off slowly to remove, and if you keep the adhesive clean they can even be reused. ENDLESS SILLY USES. Make one of these fake mustaches a part of a costume, or hand them out to everyone at a party (girls included) to make it a memorable mustache-theme party. NO-RISK PURCHASE; FULL MONEY-BACK GUARANTEE. If you're unsatisfied with this item for any reason, we'll immediately refund your purchase price. A lifelong mustache connoisseur, Mr. Moustachio set a high standard for face furniture. Always dapperly dressed in a suit and top hat, Mr. Moustachio was the President and CEO of ULP (Upper Lip Plumage). Envied by all men for this thick black hair, Mr. Moustachio never went anywhere without making sure his Handle-Bar stache was sculpted, trimmed and coiffed to perfection. Staches with Personality! Like Mr. Moustachio, adults and kids alike can experience the fun and excitement associated with a mustache using these fake mustaches! 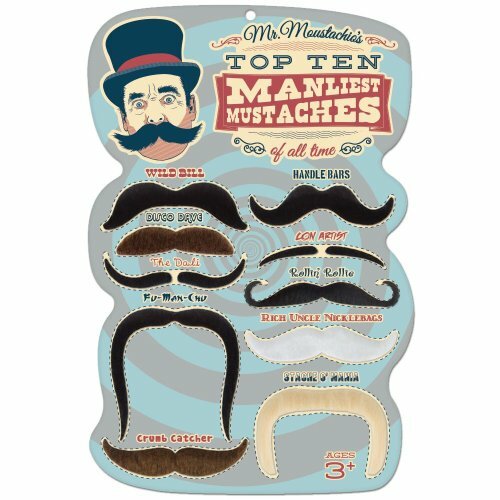 Each set comes with a total of 10 stick-on mustaches that can be trimmed as necessary to fit almost any face. Choose any of the following styles: Wild Bill, Crumb Catcher, Fu-Man-Chu, Handle Bars, Rich Uncle Nicklebags, The Dali, Con Artist, Disco Dave, Rollin' Rollie and Stache O' Mania. A Cut Above the Rest! Unlike our competitors, Mr. Moustachio mustaches offer a variety of creative styles with a personality to match. When you peel the mustache off, you reveal a unique slogan that relates to a character description on the back of the packaging. This is a great ice breaker at parties, and perfect for role-playing games. Why You'll Love Them: Depending on the style, each mustache measures approximately 2-4 inches long. 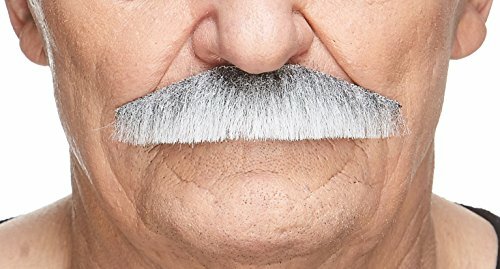 Easily applied and removed, these fuzzy staches are a fun and unique way to instantly change your appearance and attract attention. Our mustaches make the perfect accessory for any costume party or theater group. These silly staches are ideal for goody bags, stocking stuffers and giveaways. They can also be used as props for crazy photo sessions, or as a fun activity at a birthday party. Whether you choose Wild Bill, the Crumb Catcher or the Fu-Man-Chu, these goofy mustaches are sure to make you the center of attention! Easy to use: Pick a style of mustache and peel and slowly to remove the staple and backing paper, then stick to the face or other place; if you keep the adhesive clean they can even be reused. 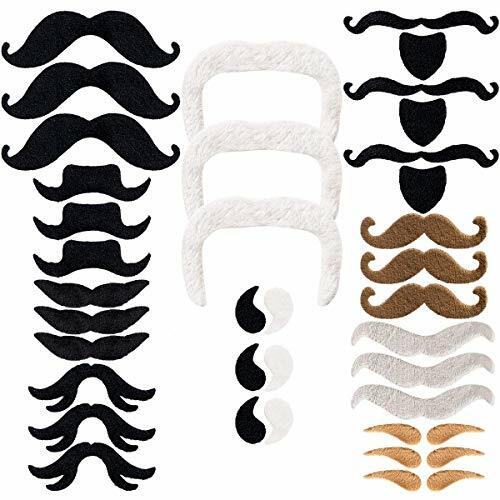 Wide range of applications: These fake mustaches are suitable for various festivals and parties, like Halloween decorations, costumes and party disguise, Mexican party, games, holiday decorations, etc. Size: about 2.6" - 4.2"
Small parts, not for children under 5 years old. Adult supervision is required. 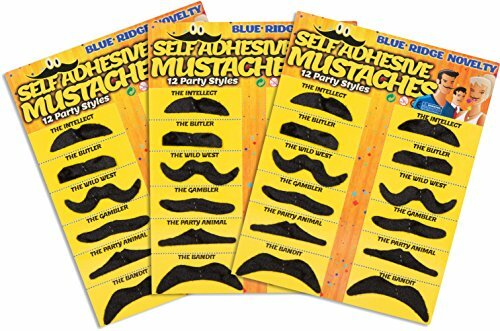 Wide range of applications - These fake mustaches are suitable for various festivals and parties, like Halloween decorations, costumes and party disguise, Mexican party, games, holiday decorations, etc. Note - Small parts, not for children under 5 years old. Adult supervision is required.If you're unsatisfied with this item for any reason, we'll immediately refund your purchase price. REALISTIC COSTUME ACCESSORY - The look you're looking for! 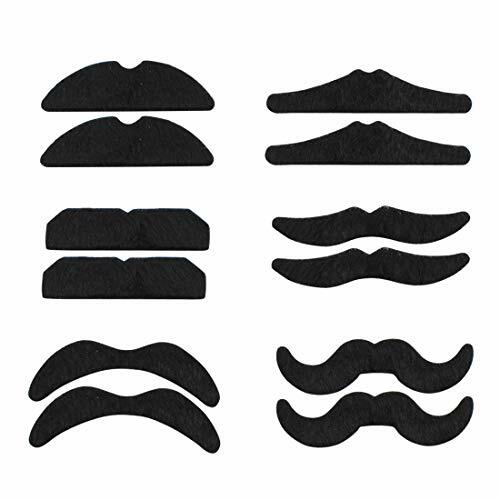 - This natural-size self-adhesive false mustache is ideal for theatre, drama clubs and cosplay. Or as a party prop or just for having fun. Makes you look great all day or night, on its own or with other special attire. Made to fit any adult. SIMPLE AND CONVENIENT - Instant false facial hair! - Easy to put on and easy to take off, yet stays in place and holds its shape for hours with the original adhesive. Can be reused multiple times, for multiple performances, with a bit of double-sided tape or spirit gum. For special needs, the moustache can also be trimmed, combed, styled and even sprayed with color or dyed, if desired. HIGH-QUALITY AND CERTIFIED SAFE - A Mustaches original! - Handmade in the heart of the Europe with a lot of love and laughter. We use only quality synthetic fur and special 3M adhesive tape that are anti-allergic and won't irritate skin, meeting strict EU health and safety standards. Don't be fooled by cheap copies with inferior materials and design - your face deserves much better! CERTIFIED BY THE EU AS SAFE - For peace of mind! - Our EU certificates for health and safety offer added reassurance. We use only high-quality synthetic fur and 3M surgical tape that are anti-allergic and won't irritate skin. The adhesive strip on this product meets strict EU medical-device standards. 100% HAPPINESS OR YOUR MONEY BACK - Really. - We want you to be absolutely satisfied with our high-quality false facial hair. So if by some rare chance it doesn't totally tickle your fancy, simply return it to us for a refund or exchange, whichever you prefer. BEST-SELLING COSTUME ACCESSORY - Realistic and imposing! 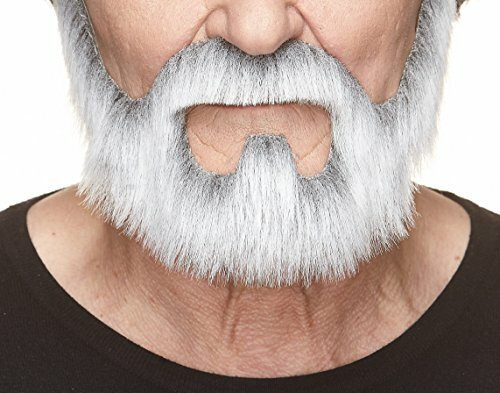 - This natural-size self-adhesive false beard and mustache is a popular choice for theatre, cosplay and parties of all kinds. Makes you look great all day or night, on its own or with other special attire. Size suitable for any adult. A MILLION POSSIBILITIES - Become that bearded hero (or anti-hero)! - From Kenny Rogers to Wolverine to a gnome or wizard or even a beautiful (?) bearded lady... Customers are continually amazing us with their original character transformations made possible by this very versatile false facial hair. It's not only for pretending you were bailed out of jail. 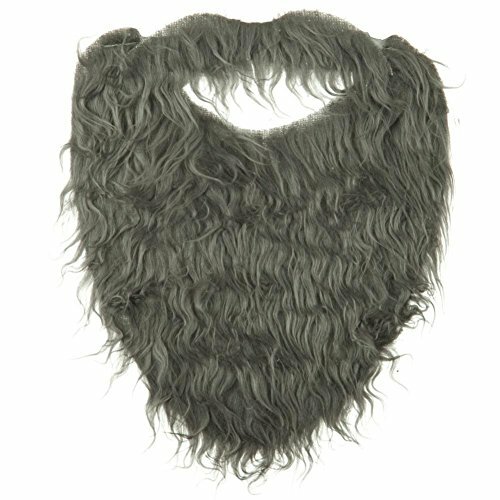 SIMPLE AND CONVENIENT - Instantly become your bearded hero (or anti-hero)! - Easy to put on and easy to take off, yet stays in place for hours with the original adhesive. Can be reused multiple times, for multiple performances, with a bit of double-sided tape or spirit gum. For special needs, the beard and moustache can also be trimmed, combed, styled and even sprayed with color or dyed, if desired. 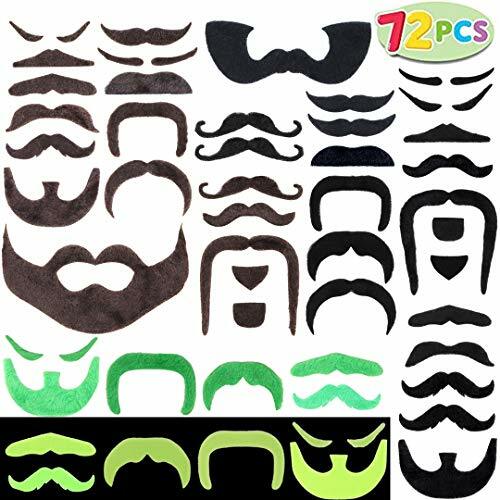 72 Pieces Mustache Beard Set includes 6 Glow-in-the Dark Effect Mustaches, 18 Regular Black Mustaches, 19 Coffee Brown Mustaches, 23 Cream-colored Mustaches and 6 Green St. Patrick's Day Beard. 20 Different Styles Moustache in "Fu-man-chu", "Stache O' Mania", "Disco Dave", "Crumb Catcher", "Rollin' Rollie", "Wild Bill", " Lampshade", "Handle Bars", "The Party Boy", "The Dali", "Pencil", "Imperial", "Walrus", "Chevron", "Toothbrush Mustache", "Hungarian" and more. Made from Fiber. Realistic Looking. Easy to Apply by Peeling off the Backing Paper and Press in Place. Easy to Remove by Peeling off Slowly. Super Value Pack for Halloween Party Decoration. Perfect for Halloween Costume Accessory, Sombrero Party Supplies, Little Man Birthday Party Supplies, Monocle Cosplay, Hulk Hogan Pretend Play, Einstein Fake Mustache School Classroom Pretend Play, Steve Harvey Mustache Style, Father's Day Decoration, Halloween Novelty Toys. CHILD SAFE: Non-Toxic. Meet US Toy Standard. Safety Test Approved. 72 Pieces Mustache Beard Set includes 6 Glow-in-the Dark Effect Mustaches, 18 Regular Black Mustaches, 19 Coffee Brown Mustaches, 23 Cream-colored Mustaches and 6 Green St. Patrick's Day Beard. 20 Different Styles Moustache in Fu-man-chu, Stache O' Mania, Disco Dave, Crumb Catcher, Rollin' Rollie, Wild Bill, Lampshade, Handle Bars, The Party Boy, The Dali, Pencil, Imperial, Walrus, Chevron, Toothbrush Mustache, Hungarian and more. Made from Fiber. Realistic Looking. Easy to Apply by Peeling off the Backing Paper and Press in Place. Easy to Remove by Peeling off Slowly. Super Value Pack for Halloween Party Decoration. Perfect for Halloween Costume Accessory, Sombrero Party Supplies, Little Man Birthday Party Supplies, Monocle Cosplay, Hulk Hogan Pretend Play, Einstein Fake Mustache School Classroom Pretend Play, Steve Harvey Mustache Style, Father's Day Decoration, Halloween Novelty Toys. These real self-adhesive eyebrows are handmade. They are attached by means of a specific 3M medical plaster (on the back side of the eyebrows). This anti-allergic plaster does not irritate the skin, is easily stuck and removed. If necessary the eyebrows may be cut, combed, or shaped by wet hands or simply by hair spray. If you want to apply the eyebrows several times, use new medical plaster or two-sided sticky tape. REALISTIC COSTUME ACCESSORY - The look you're looking for! - These natural-size self-adhesive false eyebrows are ideal for theatre, drama clubs and cosplay. Or as a party prop or just for having fun. Makes you look great all day or night, on their own or with other special attire. Made to fit any adult. 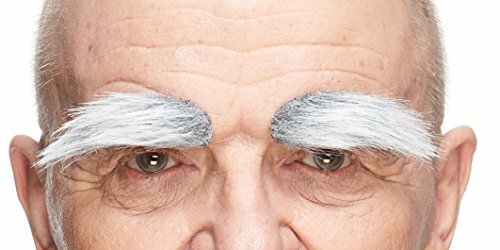 SIMPLE AND CONVENIENT - Instant false eyebrows! - They're easy to put on and easy to take off, yet stay in place and hold their shape for hours with the original adhesive. Can be reused multiple times, for multiple performances, with a bit of double-sided tape or spirit gum. For special needs, they can also be trimmed and even sprayed with color or dyed, if desired. CRAFTED WITH SUPERIOR QUALITY - A Mustaches original! - Handmade (and hand-ventilated and combed) in the heart of the European Union with a lot of love and laughter, and only the best faux furs, by one of the world's most inventive makers of fake mustaches, beards and the like. Don't be fooled by cheap copies with inferior materials and design - your face deserves comfort and quality. 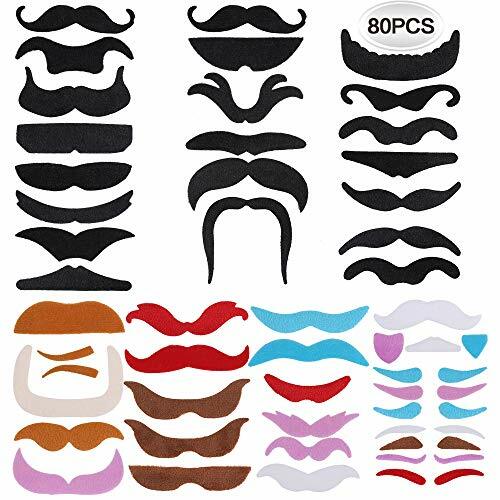 These real size self-adhesive Fake Mustache are handmade. It is attached by means of a specific 3M medical plaster (on the back side of mustache). This anti-allergic plaster does not irritate the skin, is easily stuck and removed. 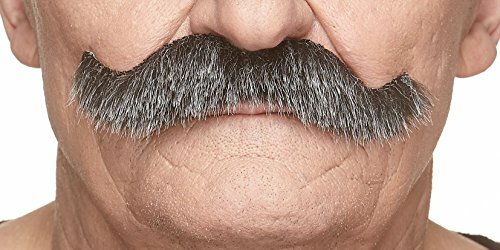 If necessary these Fake Mustache may be cut, combed, or shaped by wet hands or simply by hair spray. If you want to apply the Fake Mustache several times, use new medical plaster or two-sided sticky tape. PARTY PROP AND COSTUME ACCESSORY - Lip hair to hide behind! 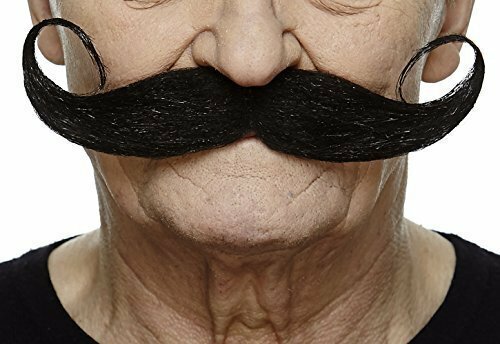 - Whether your goal is to deceive or amuse (on stage, in cosplay, at a party with friends or somewhere else) these realistic self-adhesive false mustaches are an optimal choice. They'll make you look and feel great all day or night, on their own or with other special attire. The size is suitable for any adult. MULTI-PACK for MULTI-FUN - For every friend, role or mood! - From Halloween to New Year and beyond, this moustache 6-pack is a treasure trove of chuckles and gags and hairy style. For a party, lay them out near the entrance and have guests pick one to put on when they arrive. Optionally, offer some special effects at your fake beard arrival creation station, like fake blood or styling gel. SIMPLE AND CONVENIENT - Instant false facial hair! - Easy to put on and easy to take off, yet stays in place for hours with the original adhesive. Can be reused multiple times, for multiple performances, with a bit of double-sided tape or spirit gum. For special needs, the mustaches can also be trimmed, combed, styled and even sprayed with color or dyed, if desired. HIGH-QUALITY AND CERTIFIED SAFE - Mustaches original products! - Handmade in the heart of the Europe love and laughter. We use only quality synthetic fur and special 3M adhesive tape that are anti-allergic and won't irritate skin, meeting strict EU health and safety standards. Don't be fooled by cheap copies with inferior materials and design - your face deserves much better! Great for Halloween, school plays, theatrical performances and fake disguises. Trim-able to suit adults or children. Dress up as an old man, pirate, Moses, etc. Attached elastic band for a sure fit. Full grey beard and mustache. Adult or child sized trim-able beard and mustache combo. 9 elastic band for an adjustable comfortable fit. Measures 8 1/2 wide and 10 1/2 long. Can easily be trimmed to suit your needs. - The Party Boy; The fun doesn't start until this guy arrives! DON'T DELAY; The 30-day money back guarantee gives you complete peace of mind so don't miss out! 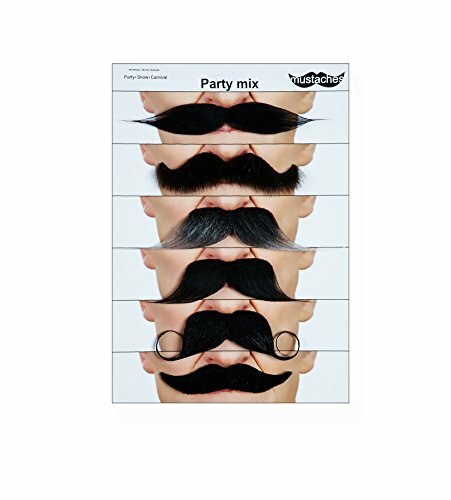 Bring this whole batch of 30 mustaches to a party and it's sure to be a hit, like mustache party, masquerade party, fiesta party, spy themed party, Cinco de Mayo party, birthday party or other themed parties. Or start handing out mustaches to everyone, letting them choose their favorite from the 10 different styles. A BIG BATCH OF FUNNY FALSE MUSTACHES 10 different styles, three of each style, 30 mustaches in all. And all of them are made from fiber for a more realistic look. A RANGE OF FUN AND SILLY STYLES Including styles like Wild Bill, Fu-Man-Chu,, Con Artist, Stache O' Mania (Hulk Hogan), and more, you'll have lots to choose from. EASY TO APPLY AND REMOVE Just peel off the backing paper and press in place. Peel off slowly to remove, and if you keep the adhesive clean they can even be reused. ENDLESS SILLY USES Make one of these fake mustaches a part of a costume, or hand them out to everyone at a party (girls included) to make it a memorable mustache-theme party. NO-RISK PURCHASE; FULL MONEY-BACK GUARANTEE If you're unsatisfied with this item for any reason, we'll immediately refund your purchase price. 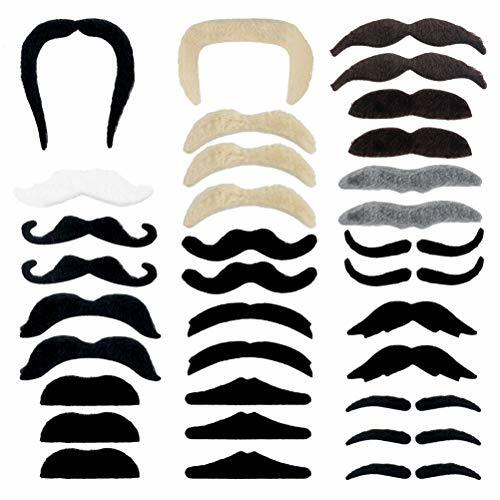 Funny Facial Costume Kit: In a total of 80 pieces of false mustaches, fake beard and fake eyebrows. The styles of facial hair are random. The multiple styles give you different choices and different experience, and also make them fit everyone's face. Colors are as images shown. Quality Material: Made from artificial short fluff with a realistic look. The unisex fake mustaches set is available for all ages, but kids should use under the supervision of adults. Self Adhesive Facial Decorations: Each one has an adhesive tape on it which make it easy to apply. No glue needed at your first use, just peel off the backing paper and then attach to your face. The self-adhesive tapes on these reusable mustaches will lack of stickiness in reuse, which will need glue to attach. 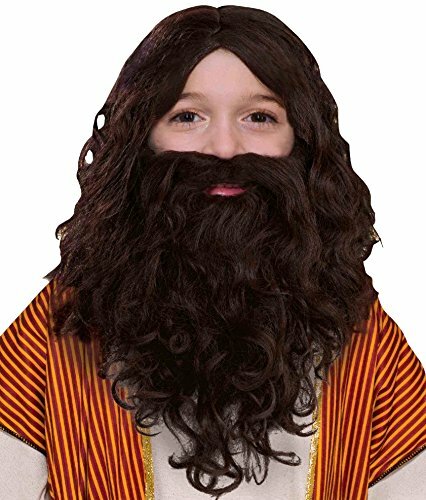 Party costume supply: These fake beard and eyebrows are ideal for the carnival, Halloween party, Christmas party, children's party, New Year party, etc. They are also perfect props for photography and performance. Tips: Due to the material, it is normal that if there is a bit of fur shedding on these false mustaches, beard and eyebrows. 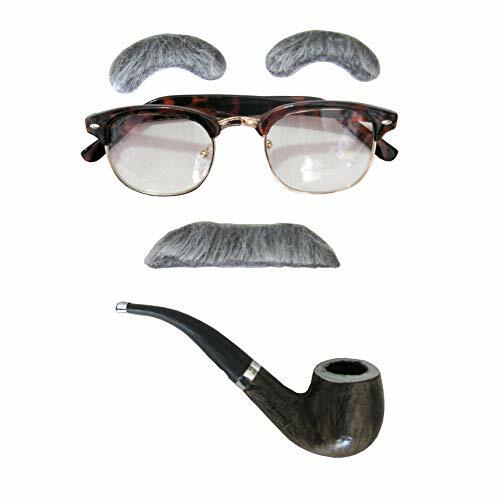 Wide application: Make one of these fake mustaches a part of a costume, can cheer you up and bring you joy, and make it a memorable mustache-theme party. Instructions: Pick a style of mustache you like and peel and slowly to remove the staple and backing paper, then stick to the face or other place. Small parts, not for children under 3 years old. Adult supervision is required. Material: Made of high quality artificial fiber, self-adhesive, no harmful substances, easily applied and removed. 6 Different Designs, 4 Sets of 12 Fake Mustaches,48 pieces musdashe in total. Easily applied and removed. It fits for both adults and children. Various occasions like game play, costume & party disguises, festival decor ,Halloween decorations,etc, to create a fun atmosphere. KKTOP provides product quality guarantee. If you have any question about our product, please contact us right away. We will be happy to solve your problem. 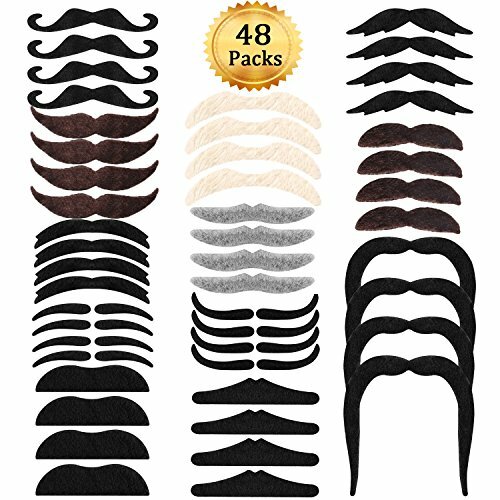 Package Quantity You Will Get: Package comes with 48pcs self adhesive mustaches, which contains 16 types, each type 3pcs. Various type to choose, plenty of mood type to choose, many age type to choose. Premium Material We Adopt: Made of good quality short plush, exquisite and delicate, realistic but funny. Great helper for shooting props, changing character, delighting mood. Easy to Use: Just peel off the paper toward back, and press in place where you want it to. Please be slowly when peeling off the paper. They can be used for several times if you keep the adhesive clean. Wide Application: These can be widely used for birthday, party, Halloween, Christmas, gift, favors; suitable for not only kids, but adults, olders. Useful Method for Delighting: 16 different mustach types for making somebody happy. Dressed with them, you will be the happy hour to everyone you around. A great idea to change others' mood. Need a Novelty mustache for a costume, orjust want to liven things up at the next party or get-together you attend? 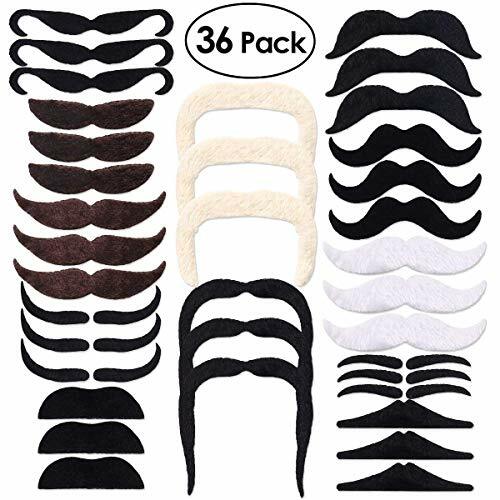 Bring this whole batch of 36 mustaches to a party and it's sure to be a hit,like mustache party, masquerade party, fiesta party, spy themed party,Cinco de Mayo party, birthday party or other themed parties. You could keep all the mustaches for yourself, and sneak off every now and thento change into a different one. Every time anyone sees you, you'll have adifferent mustache! Or start handing out mustaches to everyone, letting them choose their favoritefrom the 12 different styles. Soon the whole room will be full of folks laughing at each other's 'staches andtaking pictures to laugh at later. that's another time to make sure everyone has a mustache on! The photographerwon't have to remind everyone to smile. whether it's a child or an adult, a boy or a girl, a man or awoman. If you're dissatisfied with your purchase for any reason, contact us for areplacement or refund.